Posted on March 13, 2013 by Yohan. This entry was posted in Uncategorized and tagged invariance, mirror neurons, neuroscience, symmetry. Bookmark the permalink. ← What does fMRI measure, anyway? 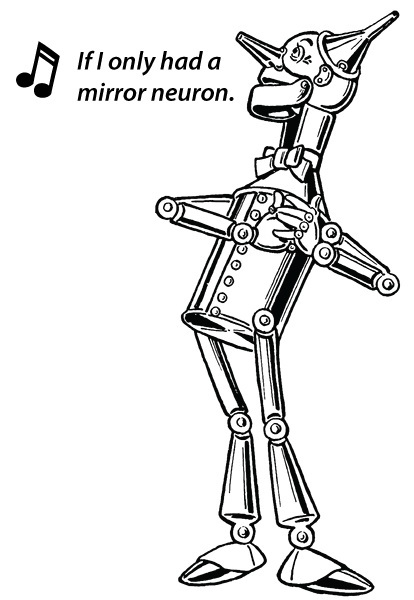 Thanks for that, I’ve always found the mirror neuron thing more than a little fraught. You’re welcome! “Fraught” is definitely an appropriate description of mirror-neuron-land! Years later it seems that mirror neuron frenzy is ever stronger. Or do you know of any published resistance since the cites you gave above? I haven’t made myself read the primary literature, but the impression I get is that mirror neurons are (thought to be) sort of a built-in, primary cause of all the motor understanding/ imitative / empathy etc behavior and psychological traits. But that posits a sort of miracle – a computational unit that somehow knows a similarity between something in the world “out there” and something that is an internal capability of the organism. And it knows it without any learning, experience, or developmental constraints. So the more they say that mirror neurons can do, the wider the range of miracles. I’m with you that these neurons must, if they mean anything, reflect the developmental experience of the organism, and learning how the brain develops their function is the only interesting question. I loved the ellipse particles analogy. Yup you hit the nail right on the head. Mirror neurons as an explanation are a kind of magical thinking. On the one hand they must be linked with behavior and emotion, and on the other, they must be situated in the causal chain of the brain. Welcome! I’m glad you liked the post! I definitely agree that scientists need to be more careful about epistemology. I’m not 100% sure that scientists even need ontology though: it strikes me that any accurate scientific model can be made consistent with any ontology. The only issue with saying that psychology explains neuroscience is that it might be teleological? Also one would need to have a debate on what ‘explanation’ really means: I come from a physics background, and over the years I’ve realized that the word ‘explain’ means different things to different people! Shall check out your link now!